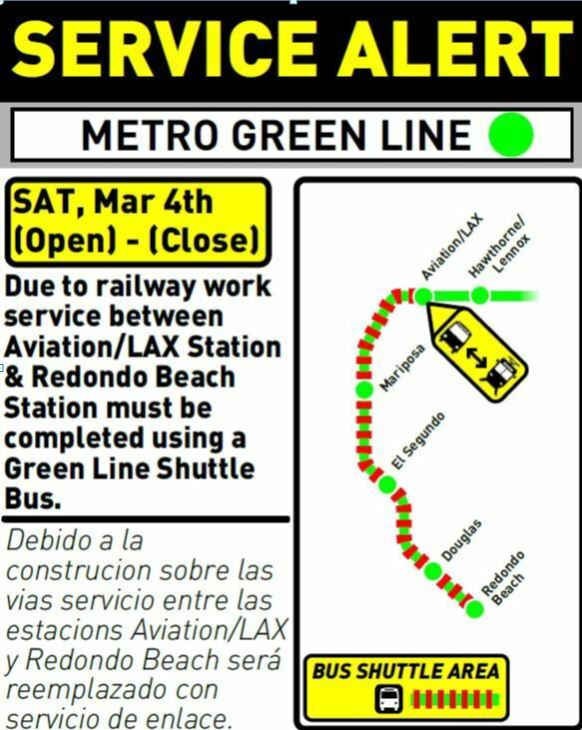 In order for crews to perform necessary track replacement work, there will be no Green Line service west of Aviation/LAX Station this Saturday, March 4 from open to close of service. Update, 10:51 a.m.: Track replacement work between Aviation/LAX and Redondo Beach Stations has been cancelled. Green Line will run normal Saturday service. In order for crews to perform necessary track replacement work, there will be no Green Line service west of Aviation/LAX Station this Saturday, Feb. 18 from open to close of service. The work will be rescheduled for another day, and the information remains available so people know what they may expect when it happens. Thank you.